Glaucoma is a disease affecting the eye’s optic nerve. Uncontrolled pressure in the eye from too much fluid damages the optic nerve. When the optic nerve is damaged, it can lead to blindness. Ophthalmologists treat glaucoma with medicine, lasers, and surgery. Glaucoma is often called the sneak thief of sight, as it has no symptoms in its early stages. It is the leading cause of blindness for people over 60 years old. Regular eye check-ups and early treatment with an ophthalmologist can greatly reduce your risk of blindness from glaucoma. As new aqueous humor flows into your eye, the same amount should drain out through an area called the drainage angle. The intraocular pressure (IOP) should remain stable with a properly working drainage angle. When the drainage angle is not working, the pressure in the eye will rise, causing damage to the optic nerve. When the nerve fibers in the optic nerve die, this will cause the development of blind spots in your vision. If all the fibers die, you will become blind. Primary open-angle glaucoma is the most common form. This type of glaucoma usually develops gradually through pressure build-up on the optic nerve. Regular eye exams can catch the early signs of optic nerve damage and reduce the risk of blindness. Angle-closure glaucoma, also called “closed-angle glaucoma” or “narrow-angle glaucoma,” occurs when the iris is very close to the drainage angle in the eye. The iris can end up blocking the drainage angle and pressure will build-up very quickly. The quick build-up of pressure can cause an acute attack. If this happens, you should call your ophthalmologist right away or you might go blind. Angle closure glaucoma can cause blindness if not treated right away. A complete eye exam is the only sure way to diagnose glaucoma. Due to the presence of many types of glaucoma, including “low pressure glaucoma,” an eye pressure test alone is insufficient to rule out glaucoma. 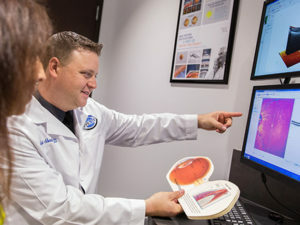 Evaluation of the optic nerve can be done visually with dilated eye exams and with a type of computerized 3-dimensional analysis called OCT. If there are suspicions for glaucoma, other data such as peripheral vision (visual field) testing, gonioscopy, and corneal thickness measurements (which affects intraocular pressure) are commonly needed to recommend the best course of observation or treatment. Glaucoma damage is permanent. It cannot be reversed. However, medicine, laser, and surgery may help to stop further damage. Selective Laser Trabeculoplasty (SLT) is a gentle laser that can often reduce or eliminate eye drops. Medication: Glaucoma is usually controlled with eye drop medicine that lowers the eye pressure. These eye drops can reduce the amount of aqueous fluid in the eye or help the fluid flow better through the drainage angle. Surgery: In some patients with glaucoma, surgery is recommended. Glaucoma surgery improves the flow of fluid out of the eye, resulting in lower eye pressure. Severe or aggressive glaucoma can sometimes need glaucoma surgery to help create a new drainage system for the eye, bypassing or supplementing the patient’s poorly functioning natural drainage system. This can be done using the patient’s natural tissues (trabeculectomy) or with a drainage implant. Minimally Invasive Glaucoma Surgery (MIGS) encompasses a variety of newer glaucoma surgeries to help treat glaucoma, while reducing the risks of more extensive surgeries. MIGS surgeries can also usually be done in combination with cataract surgery to help patients control their glaucoma. Not everyone is a candidate for these procedures, so please discuss your options for glaucoma treatment with your doctors.